Background: Photocatalysis shows great importance for conversion of solar energy to chemical energy, which represents a promising technology to solve the global energy and many pollution problems. Objective: The emerging graphene serves as an excellent building block with desirable functionalities for use in photocatalysis. Strategy: Engineering towards graphene hybrids for photocatalysis offers exceptional charge mobility, and elongated lifespan for photogenerated carriers to diminish electron/hole pair recombination. 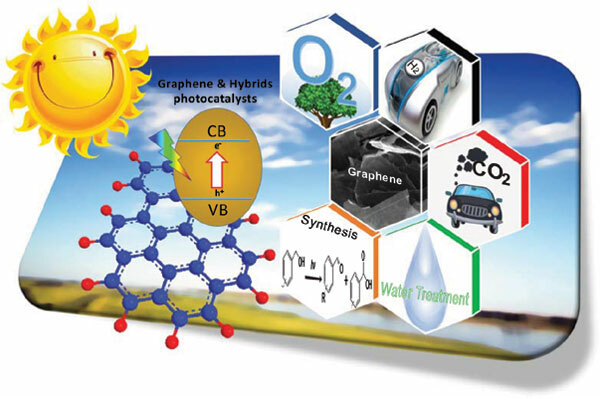 Review: This paper literally reviews the development of graphene and its hybrids for application in many photocatalytic processes including H2 evolution reaction, O2 evolution reaction, CO2 reduction reactions, chemical synthesis, and pollutant decomposition. Strategies for enhancing the properties for photocatalysis are also shortly discussed. Finally, we provide an outlook on future trends and perspectives for graphene application in photocatalysis. Keywords: Graphene derivatives, graphene hybrids, graphene-based photocatalyst, graphene, photocatalysis. photocatalytic applications. Keywords:Graphene derivatives, graphene hybrids, graphene-based photocatalyst, graphene, photocatalysis. photocatalytic applications. Abstract:Background: Photocatalysis shows great importance for conversion of solar energy to chemical energy, which represents a promising technology to solve the global energy and many pollution problems.